The Williamsburg Bridge opened up Jewish migration to Brooklyn. Today, it is a gateway to the famous hipster neighborhood of the same name. ​It was indeed. And as I unpacked my Ikea sofa into that sunken living room—60 years after Shirley snared her own—my family’s Brooklyn story had come full circle. ​By any measure, Brooklyn is the most Jewish place in America. Approximately 600,000 Jews now call the borough home, down from an incredible 900,000 in the 1940s. One in four Brooklyn residents is Jewish, the largest proportion by far among New York City’s five boroughs, according to the most recent survey by the UJA-Federation of New York. ​“There are more Jews right now in Brooklyn than anywhere else in the world, including the city of Tel Aviv,” said Ron Schweiger, the borough’s official historian, whose Flatlands home is a shrine to the long-vanished Brooklyn Dodgers (the team moved to Los Angeles in 1957). ​Scratch the surface of most American Jewish families and you’ll find a Brooklyn connection. At a Passover seder in the Hollywood Hills in 2010, I learned that two fellow diners had been my Park Slope neighbors before we all headed to California for graduate school. When conversation turned to the Dodgers, the grandparents at the table joined in, reminiscing about their Brooklyn childhoods and outings to see the team play at Ebbets Field. ​Back in the borough, a onetime bastion of Reform Judaism, Brooklyn is today the worldwide headquarters of numerous Hasidic groups, including the Satmar dynasty and the Chabad-Lubavitch movement, whose members migrated en masse from Europe after the war and stayed through the upheavals of 20th-century urban life. 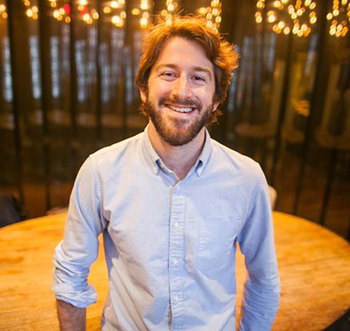 ​“Whatever your leanings are, you can find it in Brooklyn. You never have to leave the borough,” notes Gail Hammerman, a lifelong Brooklynite and former president of Hadassah’s Brooklyn region. Worshipers can choose from 120 synagogues representing virtually every nuance of modern Jewish practice, from the full Orthodox spectrum to the cultural mosaic of Sephardim. ​Some shuls have lesbian rabbis, while many are strictly gender-segregated; some are fervently Zionist, others are hostile to the State of Israel. There are grand, historic temples and storefront shtiebels (small, informal congregations). Post-denominational organizations host pop-up Shabbat dinners, interfaith seders and gay singles nights. ​But Brooklyn’s Jewish diversity goes deeper than that. Orthodox congregations thrive in predominantly liberal neighborhoods, non-denominational minyanim pepper Hasidic bastions, and Sephardi and Ashkenazi cultures mingle in ways you rarely see elsewhere. ​In just the last century, the borough has produced a host of luminaries: Barbra Streisand, Ruth Bader Ginsburg, Lou Reed, Wendy Wasserstein, Bernie Sanders, Beverly Sills, Woody Allen and, of course, the Dodgers’ Sandy Koufax. ​Nowadays, so many Jewish novelists have Brooklyn ties—Jonathan Safran Foer and Paul Auster are among the best known—that Boris Fishman, the Russian-born, Brooklyn-bred author of A Replacement Life, joked to Brooklyn Magazine last year that he was moving back to the borough in the name of authenticity. ​In Brooklyn Heights, the Kane Street Synagogue recently celebrated the bar mitzvah centennial of its member Aaron Copland, the composer whose decision to pursue music was influenced by his Kane Street rabbi, liturgical composer Isaac Goldfarb. 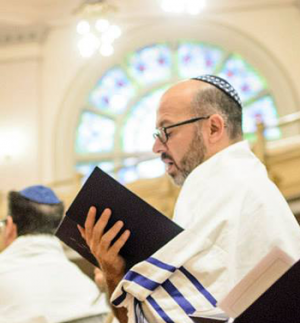 Rabbi Samuel Weintraub said his Conservative congregation—the borough’s oldest in continuous operation—helped establish a Jewish community in north Brooklyn when Lower East Side synagogues migrated north. 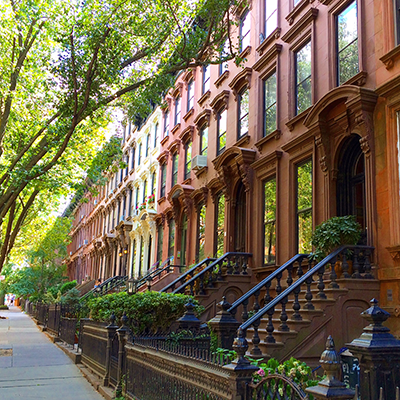 Soon those gentrified quarters—the “Brownstone Brooklyn” districts of Park Slope, Carroll Gardens, Boerum Hill and Brooklyn Heights, along with the riverfront areas around Williamsburg—became destinations in their own right. A new generation of artists and professionals, many Jewish, rediscovered the borough’s tree-lined charm and historic grandeur (and priced out others in the process, a topic of particular concern among lower-income Hasidic communities). ​Janna Pelle is one such artist. 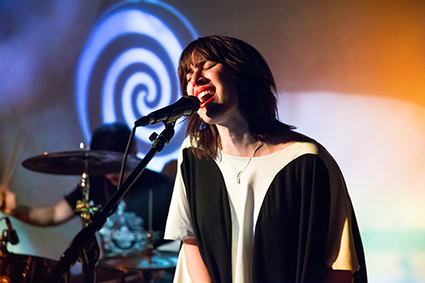 Wearing cherry-red lipstick, the Miami native belts out klezmer-inflected pop at venues like the Bitter End in Manhattan, but she never considered actually living there. “I just always wanted to live in Brooklyn,” says Pelle, 27, who is also a freelance social media guru. Alex and Zach Frankel. Photo by Jody Wissner. ​Longtime observers say that as New York City has grown safer and more diverse, the barriers that divided Brooklyn for decades have largely dissolved. “You have emerging Jewish communities throughout the whole borough, which you didn’t have in the past,” observes Hammerman, Hadassah’s current national secretary. ​Even a decade ago, you wouldn’t have seen Jewish foodies lining up for matzah ball soup in Greenpoint, where Frankel’s Delicatessen (non-kosher) opened last year. 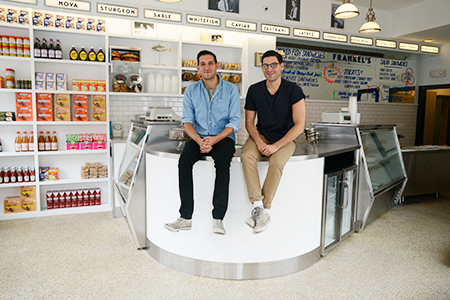 But in a district better known for its Polish kielbasa, brothers Zach and Alex Frankel—30-something transplants from the Upper West Side—decided it was Greenpoint’s moment for the kind of nostalgic Jewish noshes they grew up with at Barney Greengrass and Zabar’s. 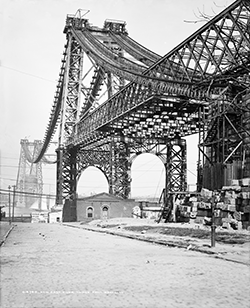 The Williamsburg Bridge opened in 1903. The story of Jewish Brooklyn began in 1654, when Asher Levy, a Sephardi Jew from Recife, Brazil, was among the first Jews to arrive in New York City. Levy was also the first member of the tribe to invest in property in Brooklyn, setting in motion two trends that have reached a zenith in 2018: Brooklyn real estate madness (in trendy neighborhoods, seven-figure home prices are routine) and Jewish community. 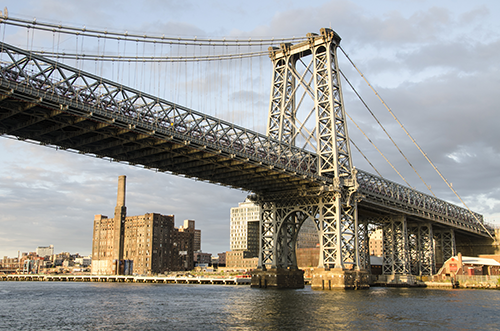 ​A century before Generation X rediscovered Kings County in the early 2000s, the original Brooklyn Jewish migration was spurred by the 1903 opening of the Williamsburg Bridge, which connected the Lower East Side with Brooklyn. ​“People used to refer to it as ‘the Jews’ highway,’” says Diner. “The locus of Jewish life switched. After that, Jews were just as likely to call Brooklyn their first home in the U.S.” Brooklyn was, in fact, a stand-alone city until its incorporation into New York in 1898. ​Gentrification began in the 1960s with an influx of middle-class secular Jews, according to Deborah Dash Moore, a specialist in American Jewry and the Frederick G.L. Huetwell Professor of History at the University of Michigan and author of the new Jewish New York: The Remarkable Story of a City and a People. “They move into neighborhoods that had never had many Jews before, buying expensive townhouses, embracing urban living,” she explains. ​Long-dormant buildings from the borough’s days as a hub for printing, banking and manufacturing awaited the newcomers, to be repurposed as condos and offices. The arrivals also revived public schools, laying the groundwork for the current renaissance of Jewish family life. Another Jewish evolution is happening in Crown Heights, where elegant rowhouses are attracting priced-out Park Slopers. As liberal Jews move into an area once split between Chabad and black families with Caribbean roots, longstanding boundaries are blurring. Kosher fusion restaurants now flourish on both sides of Eastern Parkway. 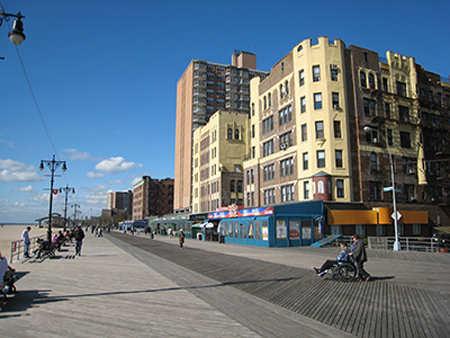 ​Along the Atlantic Ocean in Brighton Beach, you still hear mostly Russian on the boardwalk. Soviet-born Jews began settling here in the 1940s; many more arrived from the 1970s through the 1990s. The Russian Jews were largely secular, and until recently, there was scarce evidence of Jewish life in so-called Little Odessa. ​But today, an oversized hanukkiyah is prominent amid the tangle of Old World delis and bakeries under the El. Synagogues are introducing young Russian Americans to the heritage they never knew, “and there’s a lot more Jewish life here than even 10 years ago,” says Rabbi Mordechai Tokarsky, the Soviet-born leader of the Jewish Center of Brighton Beach and a galvanizer of Russian Jewish outreach. ​The younger generation switches comfortably between Russian and English—a metaphor of sorts, I thought recently, as my family brunched amid a polyglot crowd at the Masal Café in Sheepshead Bay. In its mid-century heyday, the canalside Lundy’s clam house—now the Masal building—was reportedly America’s largest restaurant. Today, the Turkish eatery is filled with families wearing Stars of David and munching on feta salad and hummus. ​My own Russian Jewish grand-parents happily bid adieu to Brooklyn, but in a taxi later that day, it became clear that their immigrant spirit is alive in the borough. My Jewish driver from St. Petersburg, Evgeny, told me how his America-bound family had spent a sojourn in Italy, and together we waxed rhapsodic about that country’s scenery and food. In truth, there never was a more Brooklyn sentiment. Hilary Danailova was the third generation of her family to live in Brooklyn. Although she now lives in Philadelphia, she can often be found indoctrinating the fourth—her daughter, Zelda—in the bistros of Park Slope and the sea at Brighton Beach. I grew up on Ave J and east 18th street in Brooklyn. The Midwood section. Went to Midwood high school. Watched the Yeshiva of Flatbush being built across from our house…Such a great place to grow up…I now live in California in Carmel and also in San Mateo….Been in California for over 40 years…..but Brooklyn is my roots…My heart never ever left Brooklyn and my most fantastic childhood…. Flatbush will always be my home till the day I die. if only in my heart. I went to the Yeshiva of Flatbush and then to Erasmus. Lived on Ocean Parkway and Beverly Road. Would have liked to have seen more about Ocean Parkway and Prospect Park in the article. My brother Terry ended up in California as well. I headed south to sunny Florida in “65. Belonged to Union Temple, the pool with the shul, on Eastern Parkway. No mention of this wonderful reform synogogue in the Brooklyn article, which I loved to Read and brought back so many memories of my wonderful childhood and adulthood. ”ADAM AND EVE SLEPT HERE” STRANGELY ENOUGH THE HOUSE CLOSE BY HAS A FIG TREE IN THE FRONT YARD. Should I think anything of that? So–who still remains here with us that did not leave?! Also went to Midwood High School.Moved from east 13th street and Ave J to across the street from Midwood. Hubby went to Erasamus. Left in 1971 and finally landed in PA… but you can never take Brooklyn out of the heart. My older brother still lives there. Thank you, thank you. Wonderful article and a wonderful trip down memory lane. I also went to Midwood and belonged to the Progressive Synagogue on Ocean Ave @ Avenue I. Actually spent my whole life in NY then retired to NE Florida. As my daughter says “You can take the girl out of Brooklyn, but you can’t take Brooklyn out of the girl!!!!!! So much fun reading about Midwood High School and Union Temple. My parents were members as kids, and that was a looong time ago! Went to PS 193, just down Bedford Ave. from Midwood. Went to Brooklyn College as well, also on Bedford Ave., never left the neighborhood! I lived on East 18th St. between L and M. Sorry to hear that Lundy’s is no longer around. We’ve been in FL since 1972, but every time we come to NY we visit our old haunts with lots of wonderful childhood memories. hi, I’m Bob Kontoff went Madison high school and PS 206. I lived on E23 between Ave V and W. Live in Pikesville, Md. last 45 years but never left Brooklyn growing up. Born in the East New York section of Brooklyn, lived on Pitkin Ave right next to the El, but my father got a raise and we moved to Sheepshead Bay – Bedford between W & X – so of course, Brooklyn College! I’ve been living in Boston for the last 30 years, but I recently asked for coffee at Dunkin’ Donuts and the guy behind me said, “ugh…lady, where in Brooklyn are you from?” So glad my Brooklyn continues to show!! My friends and I would occasionally sneak in to the Union Temple to use their basketball court. But mostly I hung out at the Brooklyn Jewish Center, the other Eastern Parkway “pool with the shul.” It’s now occupied by the Lubavitchers. Despite more than a half-century as a California resident, I’ll always be a Brooklyn boy. I left my heart in Brooklyn (forever). I lived in East Flatbush (on East 51st street & Winthrop) the first 11 years of my life. It was a mostly Jewish/Italian street. My parents were avid Dodger fans and I remember Ebbets Field radio games playing like most children remember their lullabies. My mother always said my very first sentence at 3 years old was “Mommy, Mommy, Jackie Robinson is up at bat!” I went to a shul in a little row house on East 53rd Street, sporadically. My mother said that pizza and pony tails were first introduced in Brooklyn. And I remember loving Ebbinger’s marble cake that I was never able to get the recipe for. A special trip was going to Sheepshead Bay to eat at Lundys and watch the teenage boys dive for coins in the water. Shopping in “downtown Brooklyn” at Mays was also treat. My father and uncle were offered a Brooklyn brownstone townhouse for $300 in the late 40’s or very early 50’s but they thought it was too much money and turned it down. If only, Hindsight! When my father died (he was a union movie projectionist) at age 44, we moved to Baltimore to be closer to my mother’s family. We moved just as many East Flatbush Jews were migrating to Long Island. I will always miss the bells of the Bungalow and Good Humor trucks. Brooklyn memories will remain in my heart forever. Had a long walk to Lafayette High School Met my husband at the Young Israel Bensonhurst . Brooklyn was the best place to grow up Good Memories ! Lived on E 4th St between Ditmas Ave & Ave F..Went to the Ocean Pway Jewish Center. Moved to Marlboro Projects across from Lafayette…graduated in 61′..helped Pop sell tokens for the Transit Authority. I remember driving in front of candy stores to collect Elsie Borden icecream wrappers and mail 10 of them in with 25cents to get a bleacher seat at Ebbets Field. Now in Apple Valley CA since 74′. But, ALL of you are right!! Our hearts will always be with Brooklyn! !